Aero Elite Waders are Lacrosse's lightest and most versatile waders yet. With our new AeroForm® boot, they're dramatically lighter, more comfortable and durable. But don't confuse less weight with lacking insulation. Thanks to AeroForm® technology, these boots are warm enough for the coldest waters, keeping you comfortable no matter the conditions. Aero Elite Waders are Lacrosse &apos;s lightest and most versatile waders yet. With our new AeroForm® boot, they&apos;re dramatically lighter, more comfortable and durable. But don&apos;t confuse less weight with lacking insulation. Thanks to AeroForm® technology, these boots are warm enough for the coldest waters, keeping you comfortable no matter the conditions. When it comes to support for our durable, waterproof upper, our AeroForm boot is the perfect match. Liquid polyurethane is injected into a mold around the neoprene boot sock, creating a material thatâ€™s warmer, lighter and stronger than rubber. The combination of our 7mm neoprene boot sock and our AeroForm technology provides the same warmth as a 1500G insulation level in an ultra-lightweight package. Top bungee cord and side leg gussets provide an adjustable fit. 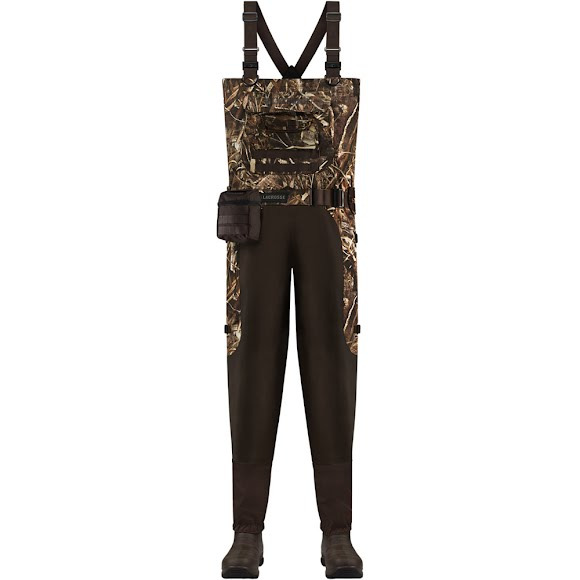 The top can be lowered without removing suspenders for easy conversion from chest to pant wader. This outsole channels the mud and muck out for superior traction.